Here’s an interesting oral hearing on the franchise for the UK’s EU Referendum granted to the leader of the Europeans Party, on 15th October, 2015 at the Royal Courts of Justice. This suggests that there is a legal area to be explored between local regional EU elections in which all resident EU citizens can participate under EU law, and national elections such as the UK’s EU referendum, the franchise for which under the EU principle of subsidiarity is devolved to member states, in this instance UK electoral law and the UK government. It is recalled that the franchise for local elections was adopted for the Scottish Independence Referendum, thereby allowing all EU citizens resident in Scotland to vote but not those resident in the rest of the UK. Should the Justices determine that the UK’s EU Referendum on continuing membership is also a matter for European law, this could open the way for British EU expatriate citizens currently excluded from voting in the EU referendum by the 15-year-limit, to be included within the franchise for the Referendum e.g. by an opt in via the “Votes for Life” Bill. 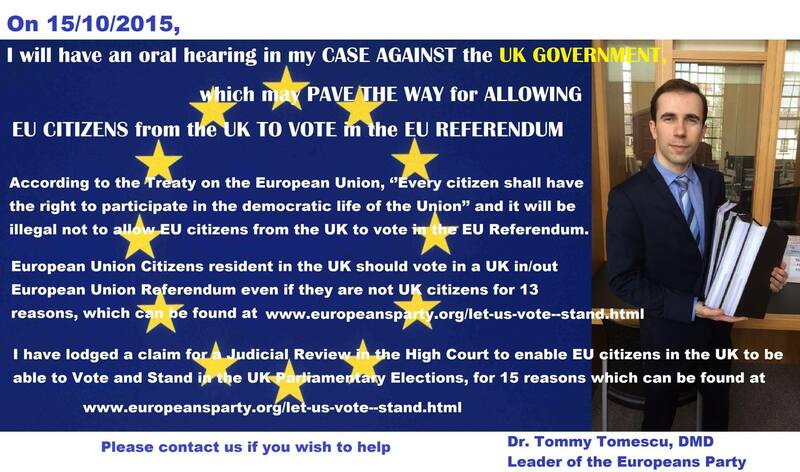 “On 15/10/2015, I will have an oral hearing in my CASE AGAINST the UK GOVERNMENT, which may pave the way for ALLOWING EU CITIZENS from the UK to vote in the EU REFERENDUM. The hearing will be held at the Royal Courts of Justice. According to the Treaty on the European Union, ‘’Every citizen shall have the right to participate in the democratic life of the Union’’ and it will be illegal not to allow EU citizens from the UK to vote in the EU Referendum. This entry was posted in All EU.Res. Expat Brits in EU.Ref., Discouraging EU Referendum Defeat, EU Ref Question - Lord Lexden 6 July 2015, EU Ref Votes for Life Response, EU Ref. & Votes for Life Bills, EU Ref. excluded British Expats React, EU Ref: Overseas Electors - Counter Arguments, Harry Shindler Presses PM., Oral Hearing on EU Referendum, Voting Rights and tagged 15-year-rule, 2014 European elections, British expatriates, EU Referendum, national voting rights. Bookmark the permalink.